The vineyards that produced this wine are located on the part of the Brand called ‘Steinglitz’. This area is located in the heart of the Grand Cru, facing full south on a steep slope, which accentuate the natural drainage. What makes this area special is the composition of the soil: granite biotite is granite that contains both white and black micas. White mica is quite inert (silicium), but black mica contains a lot of minerals and can produce clay while being decomposed by micro-organisms. Rainfalls will eventually drain these elements in deeper cracks in the soil. As long as the roots of the vines do not reach them, the wines will not express true Brand character! Older vines will reach these elements, but more importantly, good biodynamic practices will help the roots grow deeper and reach these layers, in order to acquire complex minerality. 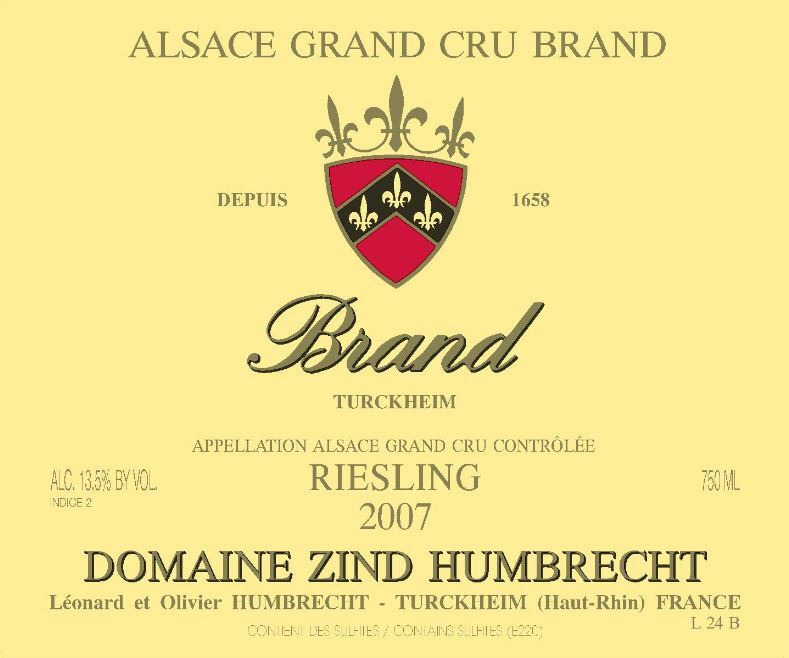 In 2007, these grapes were harvested very ripe with a beautiful mature acidity.. Fermentation was fast and almost complete with little residual sweetness. 11/2008: the nose is already very expressive and aromatic, revealing the fruity style of the Brand vineyard. It shows lots of white flower, lime-tree, wet stones minerals. The soil influence is of course more obvious on the palate, where a delicate saltiness adds some character and gives a more restraint style, more typical of Riesling. The palate is showing great balance between the acidity and the fruity palate. The finish tastes quite dry, there are some residual sweetness somewhere, but well hidden!